"MF Global Holdings Ltd, the futures broker run by former Goldman Sachs chief Jon Corzine, has filed for Chapter 11 bankruptcy after a tentative deal with a buyer fell apart. The firm's meltdown in less than a week is a stunning setback for Corzine, who sought to turn MF Global into a mini-Goldman. Corzine became CEO last year after losing his governorship of New Jersey, and his big bets on euro-zone debt sealed the company's fate." Guess that whole revolving-door thing doesn't work as well when there's no massive government bailouts available. "Regulators are examining whether MF Global diverted some customer funds to support its own trades as the firm teetered on the brink of collapse. The discovery that money could not be located might simply reflect sloppy internal controls at MF Global. It is still unclear where the money went. At first, as much as $950 million was believed to be missing, but as the firm sorted through its bankruptcy, that figure fell to less than $700 million by late Monday, the people briefed on the matter said. Additional funds are expected to trickle in over the coming days." At first I thought that you were commenting on my - um - lack of productivity here, but then noticed that you have also been AWOL on your blog for a while. Still, you have been a rock of consistency compared to me, I've been MIA for almost two months. I find the whole "real life" thing to be quite annoying. I may exercise my editorial prerogative and add an image to your post. Hopefully you will not find it objectionable. I think it adds another dimension of meaning to your "obligations" title. This MF Global thing is getting curiouser and curiouser. Dipping into the client's funds to backstop the firm's heavily leveraged and high risk bets on European debt is about as serious as it gets. We're talking - Federal Felony - criminal fraud and theft - go to jail - do not pass go - throw away the key - kind of serious. "The futures broker sold $325 million of five-year unsecured notes, the company said today in a statement. The notes will pay an extra percentage point of interest if Corzine is named to a federal post and confirmed by the Senate before July 2013, New York-based MF Global said yesterday in a regulatory filing. 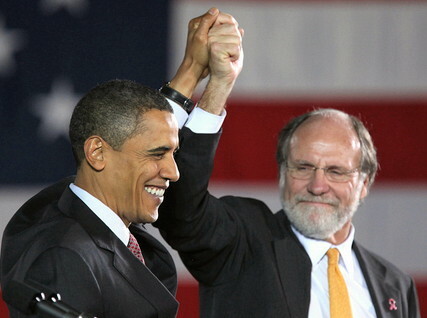 Corzine’s employment contract is written with a view to future government service. It stipulates that he’ll be paid his $1.5 million retention bonus on a pro rata basis if he leaves to work for any “U.S. federal, state or local government” before March 31, 2014." I wonder if Corzine's retention bonus, and the bond interest kicker is invoked by Corzine working in the laundry of a Federal Prison? I would've found a similar image if not time-challenged, so no objection at all. Yeah, I promised myself to post at least once a month, and almost missed October. It's been a busy year, and the upcoming one promises to be likewise busy. Dangit, the linkie got lost. Another Obama/Corzine photo. Corzine's party affiliation is (surprise!) missing from most of the major news outlet stories on the MF Global scandal. The NYT in particular has a hard time noticing that he's a Demmocrat and major Obama donor.